The mass meeting in the Valby hall 17th of December was a lost left wing opportunity to support the climate justice protesters. One can wonder why. In scale it had only two indoor competitors. Al Gore was supposed to speak at an indoor mass meeting organized by Berlingske, the most conservative daily in Denmark since 250 years. 3 000 tickets were sold but refunded as Al Gore chose to not come. The main stream climate campaigners gave walk over to the left. The other competitor was the other mass activity in Valby during COP15, the so called climate prison with the infamous cages were the detained got pepper sprayed by the authorities if they protested to much against their degrading treatment. In total almost 2 000 were detained during COP15, most of them in this Valby temporary prison. According to reports the protest spirit in this prison were at times as high as in the Valby hall, and maybe more lasting. The ALBA mass meeting was perfectly timed and placed in relation to the political process of inside and outside activities during COP15 7th to 19th of December 2009. In Copenhagen four mass activities were organised to politically intervene in the climate negotiations and/or build an independent climate justice movement. All four complementing each other both in form and their political direction. The December 12 demonstration built on the idea of a low common denominator and large variety of expressions, even contradictory. A market place for demands mainly to put pressure on governments for a ”real deal” and thus state centric in its dominant appeal. The Klimaforum starting on December 7 with a political unified goal to challenge the ideology and practical proposals followed by the dominant forces inside COP15 more focused system critique and on movement building and diverse local solutions. The Reclaim power mass action on December 16 challenging the official conference directly by attempting at disrupting it during a day of mass civil disobedience. And finally the mass meeting on December 17 with presidents from Venezuela and Bolivia supporting sustainable alternatives to the present model of development promoted by COP15 with a socialist state centric tendency at the bottom. The mass meeting came the day after protests reached a peak when civil disobedience activists both on the outside and the inside demanded system change not climate change in the Reclaim power action. The mass action could succeed in political practice. Although the action was violently stopped by the police when the two groups were less then 50 meters from each others the protesters got full support from the tribune inside the general assembly of UNFCC by the president of Bolivia and Venezuela. What the mass action failed to do physically against a violent police force it succeeded by building a political alliance across the wall around Bella center. Thus the presidents of the ALBA countries and those Danish organizations that arranged a mass meeting with them the following day had the best of opportunities to take initiatives for moving the struggle ahead. Morales or Chavez would certainly not stopping the Danish organisers to take such a political intiative. On the contrary they supported the protesters goal of system change as well as protested against the heavy repression. The situation was considerably helped by the facts that for the first time ever the police of a host country of a UN meeting had been violently attacking accredited UN delegates when they wanted to leave the official venue and furthermore that 918 demonstrators had randomly been arrested during a mass demonstration some days earlier in an act of police violence against democratic rights which probably lack any precedence in Europe the last 50 years. People from almost any kind of movement, young conservationists, Hare Krishna, Friends of the Earth and Attac members, Socialists and people’s high school students. For some reason had the Danish organisers not acted collectively defending their demonstrators. Some actually supported the police as the Social Democrats while the spokes person for the organisers made a press statement about disproportionate police behaviour as if these acts of diverging messages to the media was sufficient reaction on the massive degrading and anti democratic treatment of demonstrators. The political content was already worked out in unity at the Klimaforum in the declaration process ending in the demand System Change – not climate change, something that all actors agreed to from the Climate justice bloc that was attacked in the demonstration on December 12 to the Reclaim power action to the ALBA presidents. The title of the mass meeting in the Valby hall fitted well in – ALBA a solidarity and sustainable alternative. A politically better situation for a system critical movement of movements had not occurred in many years when peasants, environmentalists, indigenous, women, workers, antiimperialists, pacifists and above all young people were building a long term political program for climate justice. The great obstacles had been differences in tactics and the extreme level of repression. Formal Danish organisation whether left-wing, environmental, trade unions or others had all with one exception been advocating that the problem were activists and especially activists that wanted to use civil disobedience at the official COP15 venue. This in their eyes would result in immediate violence which had to be avoided at any cost. In Denmark the formal system critical organizations stated in chorus it is impossilble to defend any civil disobedience at a legal assembly as the UN. 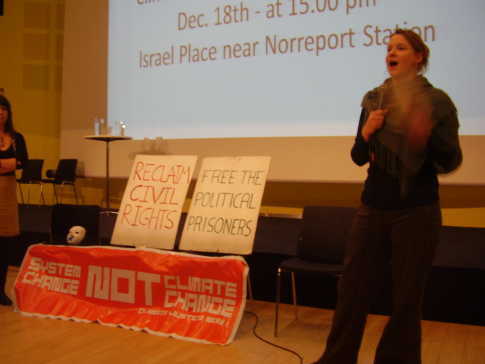 Thus the Danish activist network that jointly organized the Reclaim power action together with global mass movements as Via Campesina, Jubilee South and People’s Movement on Climate Change was isolated by all formal organisations in Denmark as a threat to mass mobilisation in the form of a broad demonstration together with NGOs and celebrities as speakers. Many actually accused the Reclaim power action for the new laws and extreme repressive police tactics that emerged in Denmark,. This trend has been going on for many years in Denmark both during the present right wing governments and earlier during the centre-left governments. By challenging this trend towards escalating repression those claiming the need of non-violent actions at Bella Center was accused of causing growing repression and thus also threatening the necessary large scale mobilisation for the broad December 12 demonstration. If only people stayed away from any confrontational actions, maybe did some civil disobedience far away from the politicians, police repression would be so much less was the political thinking behind this attitude. For many people from the third world this kind of Danish thinking was completely impossible to understand as if repression is the result of that some organizes non-violent direct actions and confrontational protest and not the result of social relationships and material conditions in society. By December 17 there had been all chances to discuss the matter with the movements from the rest of the world willing to take part in the Reclaim power action as they had been in Copenhagen for more than a weak. The Danish system critical organisations whether ecological or left wing had all chances to have a dialogue with their international cooperation partners. After all the Climate Summit was not only a Danish business. By December 17 it was also obviously clear to everyone that the Danish formal organizations were wrong. No violence was caused by the activists during the December 16 action at all. The very little bit of violence during COP15 had taken place on Saturday outside the demonstration close to Christiania when a policemen was reported being hit by a stone although no reports claimed any serious harm. Property damage was also not the case during the Reclaim power action and very little on December 12, a dozen windows broken by demonstrators who were forced into the main demonstrations contrary to their plans to go elsewhere. The repression excesses by the Danish state were completely exposed as outrageous to anyone able of doing some political work. It was with other words a perfect situation to make a collective support for democratic rights against the governmental and right wing xenophobian and climate sceptical Danish People’s party to drastically raise already extreme repression laws and police tactics against protesters. 918 people had been arrested for doing nothing in a normal demonstration and then had the police used many kinds of violence to prevent a joint inside-outside People’s Assembly close to the fences of the Bella center area. If there was any chance to revert this drastic attack on democratic rights in Denmark with great risks for the rest of Europe and the world it was now. There was certainly a sufficient number of left- wing organizations arranging the mass meeting. They included five local trade unions, four communist parties and the red Green alliance, Friendship organisation with Cuba, Venezuela, North Korea and Bolivia as well as some solidarity organizations with Latin America and the world and Artists for Peace. Many of these organizations of course produced individual statements as did any serious environmental organisation or Amnesty protesting against the mass arrests. But to do something in common was far beyond what the Danish left-wing organizations thought of as necessary. Collective action and mass movement is a common word in the language of these organisation, but when this collective action is needed and the mass movement exist and is under attack the response from these formal left wing organisation is a refusal to do anything about it. This extremist position to allow the police to freely use the new anti democratic laws which the Trade Union Central in Copenhagen called police state laws needs an explanation. Why can we not anymore in a common European state trust the left-wing to defend popular movements, let alone their own interests anymore? The resources were at hand. One of the Communist parties arranging the mass meeting publishes a daily, actually the only daily linked to any left wing party in Denmark. The parliamentary Social democrats, Socialist People’s Party and the Red Green Alliance long ago let their dailies and even weeklies sometimes pass away and lack own strong media to reach out with their message. But Arbejderen, The Worker, exists and reaches out to quite a few as it is the only left-wing daily in the whole country with more than 4 000 subscribers. Furthermore has most of the Communist parties as well as the Red Green Alliance youth groups that are quite a lot involved in the street actions going on and do not lack organizational capacity if needed. There is capacity to mobilize in Copenhagen among the left. Some hours after the police struck against oil war refugees from Iraq and violently started to deport them from the Brorson church in Copenhagen half a year ago 20 000 demonstrated in a fast reaction. But this time the leftwingers chose to avoid initiating a Danish collective action to protest against the heavy repression in spite of that it would have been very simple to get broad support also from organizations as Friends of the Earth International and about any international organisation present. The only thing needed would actually have been to join the initiative on the way already for a demonstration the next day on December 18. The Valby hall meeting would be an excellent opportunity for Danish organizations to take a lead in mobilizing the Danish people against the degrading treatements and arrests. After all Danish organizations can better mobilize people in Copenhagen and follow up on the necessary anti repression work in this country than international organisations can do. But the Danish left-wing rather clapped their hands when Chavez and Morales protested against the repression on the streets of Copenhagen than wanted to do something about it themselves with the support of the ALBA presidents. So why did they chose to stay passive against their own self interest and against the need of the global mass movements that they so much talk about in their newspapers? There are at least some factors behind this lack of solidarity. One is isolation. 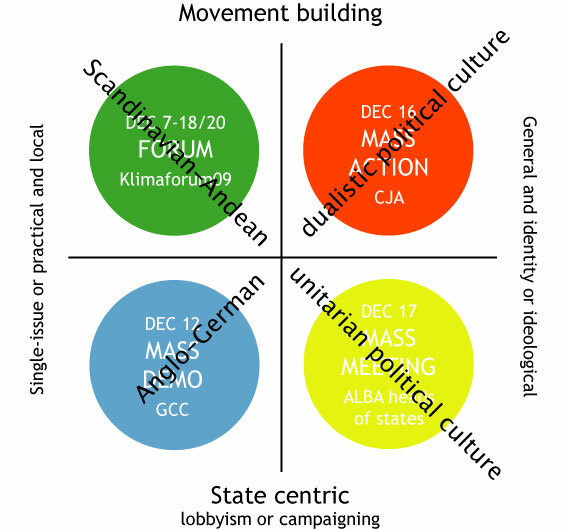 The formal left wing in Denmark had chosen to organise their own activities far from any interest in cooperating internationally or as a force inside movement building mass activities as the Klimaforum or Climate Justice Action. Only the cooperation with main stream NGOs who chose celebrities or party leaders as speakers for the demonstration was to them of interest as they could use this lowest common denominator activity to brand their own organization rather than to contribute to building a mass movement. Thus contrary to e.g. Sweden during European Social Forum did the Cuban friendship association state that they were only interested in making their own activities at Klimaforum and not as the Swedish Cuban association state that they wanted both to make their own activities and contribute to the common work during ESF. In Sweden the Cuban association representatives became a coordinator of the program group and did many other tasks for the common good, in Denmark the main initiator behind the ALBA meeting, which officially was part of the Klimaforum program but placed elsewhere due to lack of sufficiently big hall, was the Danish Cuban Association who chose to isolate itself from any common responsibility for the Klimaforum. And so did all their left wing cooperation partners that arranged the ALBA meeting. Why do something to enable a mass movement to evolve when one can sit in isolation to clap the hands in hope that people on the other side of the planet shall make the revolution for you or walk in a demonstration branding your organization were the media message is to a large degree controlled by NGO celebrities? Furthermore the Danish organizers had no links to their international counterparts. The kind of traditional state centric left wing politics which dominates the organisers of the ALBA meeting have its strong counterparts on the international arena in the People’s Movement on Climate Change as well of course in the ALBA countries. PMCC was the most loyal of all international networks towards all mass activities in Copenhagen not imposing it own will but giving strength from the very beginning to common efforts thus uniting the Danish and international partners. While many other international networks had much of their own agenda and only slowly started to be interested in such an initiative as Klimaforum PMCC was there from the very start to the end. They insisted on the need for stating that the economic system have to change and national sovereignty as important but for the rest they at many times in the Klimaforum declaration process could contribute with consensus formulations from their long time work with mass movement cooperation mainly in the South and with migrant communities in the North. When I in October informed them about the ALBA meeting they knew nothing about it although it had been initiated already in the summer and PMCC had been clearly visible at the international CJA preparatory meetings in Copenhagen. But the Danish left wing is primarily internationalist in words and primarily with those in power at state level it seems. Internationalism in practice in the climate justice movement was not what interested the Danish Left wing 2009. 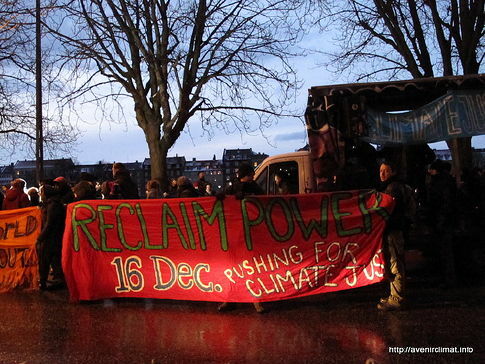 Another reason for the lack of interest in solidarity with the international movement in Copenhagen was that many left wing organisations in Denmark had been strongly advocating against the reclaim power action and instead promoted the December 12 demonstration. Their argument was that it would be impossible for the public to understand why a civil disobedience action took place to establish a People’s Assembly inside the Bella center area. If the mass movements from the South as Via Campesina which most of these left wing organisations strongly claim they support as long as they organise heroic struggles far from Denmark saw such a need, that was not of interest to discuss. Danish organisations are primarily Danish organizations and as such racist. It is useful to use Via Campesina as an exotic example in their propaganda but not as a cooperation partner then maybe something is at risk. The control freak of any Danish organization seems than to become a maniac against even his own interest with the exception of very few individuals or organisations that alone have to carry the burden of the many. The daily Arbejderen was one of these left wing spaces used by representatives of the Communist party owning the paper to state that the Reclaim power action was bad and the demonstration on the December 12 was the good alternative. The chair of the construction workers union in Denmark who was the only Danish key note speaker at the ALBA mass meeting had the same opinion in a letter published in a few Danish dailies signed also by a fisherman and a peasant, both chairpersons of other social movement organisations. It took a very long time before any system critical formal organisation made their strong opinions against the Reclaim power action public but once they did so it seems as if nothing anymore can change their mind, even when it is clear that they were wrong. The Danish super model that was selected speaker at the December 12 demonstration was on one main Danish television channel the only political messenger of the 100 000 voices in the demonstration. Between pictures of her catwalking in her model career she stated that there are quarrels in any family and so there is at COP15 but in the end the problems will be solved. The message of how police were beating UN accredited persons on their way to the People´s Assembly December 16 could not be misunderstood, the claims by some or many formal Danish organisations that the activists would become violent was shown to be completely false and the action got full support from Morales and Chavez from the inside. But why bother. The activists had objected to the wise persons in the formal Danish organisations and thus had both them and all the 918 mass arrested in the December 12 demonstration broken a golden Danish rule, always trust a COP and their definition of what is violence. What the Danish left-wing might do is issuing individual press releases, but more cannot be expected. After all, heavy repression with targeted arrests of almost all spokespersons of a non violent civil disobedience action, is what one deserves if one have gone against the advice of all formal Danish left wing organizations and dared to unite with mass movements from all over the world in front of the nose of the hitherto monopoly actors in Danish radical solidarity work. The organisers of the ALBA meeting had of course different possibilities of doing something. The organization that seems to have been most positive towards Reclaim power was a communist party still looking upon Stalin as an important ideologue. Their capacity to mobilize many was limited both in terms of Danish support and any links to central international climate justice organizations. The Red Green Alliance had the opposite position and actually excellent possibilities both in Denmark and the rest of the world. They had the chance as a modern radical left-wing party and one of the few that at least for a while even had a proper agricultural programme strongly present in Summit protests since Amsterdam 1997 and in the global justice movement. They also played a central role in organizing of the December 12 demonstration, or at least one of their International Socialist members. On photos from the preparations for the ALBA meeting one can see Thomas Eisler from Red Green Alliance, member of the national board of the party and active in the Fourth international as well as European Social Forum last year. Especially interesting it is that in 2002 the Red Green Alliance did a very good anti repression work from the early start of the preparations ot the EU Summit protests in December that year. Together with representatives from the Socialist People´s Party they acted as parliamentary shields when activists crossed the borders and at street actions constantly using the parliament as a tribune for the movement. The autonom or what also can be labelled libertarian leftist movement coming from the house occupation and anti fascists action networks used the opportunity for organizing a non-violent civil disobedience action at the Bella center. People dressed up in protective gear with some 700 supporters were able to push themselves into the Bella center area a little bit, a political statement was made and the political action dissolved without any escalation of violence. Thus the statements by formal Danish organizations that such a kind of non-violent action at a legislative assembly was impossible in Denmark without escalating into violence was false. It had been done before with a similar right wing government. and that time without governmental spokes persons inside welcoming the content and the form of the protest and full support from some global mass movements more than fully possible. But not to the Danish formal left. It was not so that key organization did not know of the good experience from 2002. On the contrary. The organisation that arranged the action in 2002, Global Roots or Globale Rødder do not exist anymore. But many of the organisers of the action in 2002 are still politically very active. Quite a few are now employed at the parliamentary office of Red Green Alliance. Palle Dragsted, earlier international secretary of the party, now media secretary is one of them. So how come than that the Red Green Alliance did not use the great opportunity to initiate broad protests together with many other Danish organizations and international networks on December 18 to free the climate prisoners and protest against mass arrests? The structural reason is simple. Since 2002 the party have drastically changed. Not on the surface but in the core of its way to act politically. In 2002 the party put a lot of energy including staff into be part of movement mobilisation. Now the same resources are instead put into media communication. Movements are interesting if they can deliver sound bites that the party can use occasionally in the parliament or in their press releases. It is not any longer of interest to be loyal to a movement and part of their daily struggle. Thus Red Green Alliance spokes persons can talk about in the media that it would be better if the police used the dialogue tactic which successfully was used to avoid escalation of repression in 2002, not to be self critical about the change of the way the party itself relates to movements in risk of getting repressed. One of the actors in this change of the political culture of the Red Green Alliance are the organisers of the autonom non-violent action in 2002. Once they themselves were able to achieve a professional career in the party they seem to gladly abandon the solidarity character of the party that once helped them when they were movement activists and instead making the party more integrated to professional media and parliamentary arenas. They are still able to mobilise. Many of the old global roots people have been behind the massive mobilisation against the deportation of the Iraqi refugees defending church asylum. But doing action during COP15 the old global roots activists saw as not useful as there were to many policemen to challenge. Rather contribute to such actions as Shut it down against the coal power plant in Copenhagen in September last year or actions after COP15 but not during was their mantra among them. They were quite a few, often male, half cynical, and always well informed about the latest thing to know for a radical belonging to a common culture in many different left wing organisations in Denmark. Interestingly this seems to include avoiding mobilisation against repression. Thus what we see in Denmark is that all strands of the formally organised left wing are equally passive when it comes to strengthen the climate justice movement and the general struggle to protect democratic rights for everyone with the exception of individual activists in Klimax and Climate Collective and to some degree left wing youth organisations. Some of these youth organizations linked to political parties were as one could expect part of organising ad hoc protest at the Valby climate prison on December 12. But these left wing youth organisations were not organisers of the Valby hall mass meeting and seems in general be regarded by their parent parties as marginal youth phenomena not to be taken much seriously. The different communist parties are mainly competing with each other. The trade unions whether social democratic or not are stretched between a perceived importance of good relationships with the government and the daily struggle against the further brutalisation of working conditions. They experience how their pickets against privatization of services are broken by the police with false promises of releasing an arrested picket leader. They criticized the hooligan law package as an attempt to repress all popular movements and non-violent actions, whether pickets, strikes or environmental protests and stated that they were expressions of a police state mentality. All social democratic and other trade unions in Copenhagen protested but the Social democrats seemed not impressed who supported the mass arrest of more than 900 innocent people to not talk about the government. The Socialist People’s Party spokes person also supported the police and only after many protested withdraw the support somewhat for the police. The Red Green alliance with its two minority trotskyist fractions and a main stream that do not know what to do is at the moment not much of a party, more of a branding operation to support differing professional careers with the help of much volunteer work but little coherent strategy. The autonom left is interestingly also very central in the lack of the support against repression of the climate justice movement. The same kind of Danish mechanism that we saw in the case of the Communist party owning the daily Arbejderen and the construction workers union seems to be working also here although the arguments against direct action at Bella center are the opposite. We do not support the actions so we refuse also to protest against repression of the actions. The autonom left did to a great part avoid supporting action during COP15 due to an analysis based on the pragmatic idea that the police force was to strong to be able to win any substantial victory. As isolated in its Danish box as the rest of the left in Denmark to establish a discussion in solidarity with movements coming from abroad was uninteresting. To win a struggle in action was mainly seen in physical terms and numbers of participants, not political terms and ability to create new political horizons and alliances. Thus in their international contacts with their allies in other countries they put forward their scepticism including sharp criticism on how weakly CJA actions were prepared. Something they, with their sometimes longer experience, could have positively improved but chose not to. It was more interesting to be a clever observer than to intervene side by side with people from other countries coming and taking the risks these Danish autonom did not want to take. And as they did not support the actions they as many other Danish left wingers tend to avoid the immediate necessary strong anti repression response needed in December during COP15. The result of the lack of leftwing support for mass mobilisation against repression of COP15 protests can be seen in such things as that Greenpeace activists in prison after a Gala dinner action get a very high degree of support and attention while the rest of the climate protesters get support to quite a large extent in falling degree due to if they have organisational backing or not. The massive mobilisation to support all repressed climate activists have lacked were it is needed most, in Denmark thanks to the lack of formal organisations supporting such a mass mobilisation.